Posted on December 7, 2013, in A Virgin a Day, Arizona, Carpe Diem, I Heart Macro, Recuerda Mi Corazon, Shadow Shot Sunday 2, Shine the Divine, Southern Arizona, tan renga, Wellton Memorial Cemetery and tagged cemetery, faraway, home, sailors, shadows, tan renga. Bookmark the permalink. 26 Comments. Maybe a graphic without colour or fancy framing, but somehow the lines create a beautiful feeling of soul. What a beautiful poem. I don’t think I’ve seen a Madonna with a crescent moon underfoot like that. Interesting image. I have a similar image from a grave stone here! 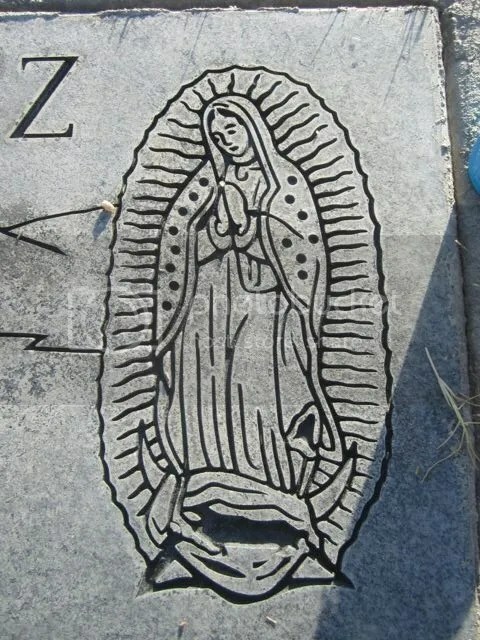 I wonder how/when/where that tradition started-the one of images of Mary on grave sites? Visits to cemeteries in the Southwest are always a uniquel experience. I love your haiku and Our Lady on the gray tombstone. The moonlight streaming down is always so magical and nourishing. Your haiku typifies that feeling so incredibly beautifully! love your verse, as usual. and this is a different image of Our Mother! is it part of a tombstone? Yes, it’s part of a tombstone. As you can see, I wasn’t successful in avoiding the final letter (Z) of the deceased’s name! curious – it looks as if she is standing on the horns of a dilemma. A nice slice of shadow. Nice words to go with the whole shot. I really like the line about the sailors coming home. We are all sailors, aren’t we? A soulful post, thought provoking. she is almost in the shadows. and she is the Lady to do it…really great both your completion and image.